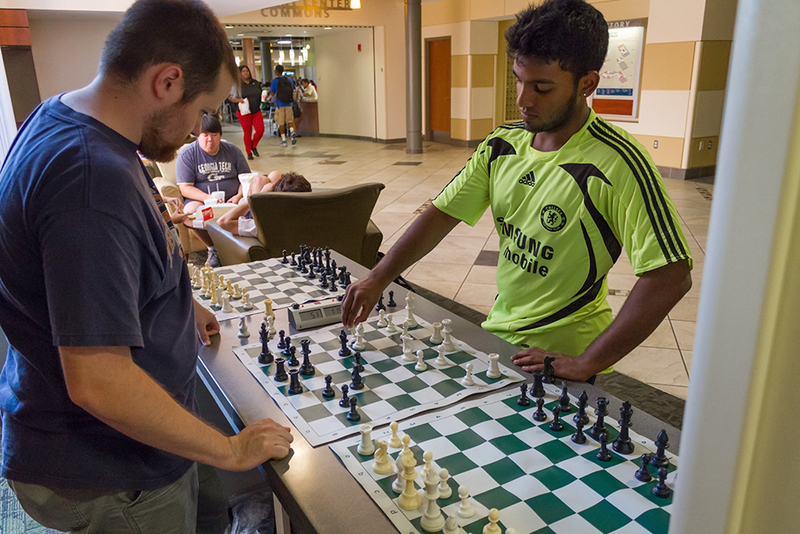 Every Friday starting around noon, a group of students gather at the Student Center to spend their afternoon playing chess. The Georgia Tech Chess Club wants to expand beyond being just a social gathering of chess players at Tech, and club president and third-year ChBE major Deepak Aaron has plans to do just that. Aaron is a strong candidate to be that catalyst as well, as chess runs in his family. In fact, Aaron’s grandfather was a nine time national champion in India and was a major influence on chess in India. “I’ve been playing since the age of four or five. My grandfather was India’s first international master. It was passed down to my father and then passed down to me,” said Aaron. He played his first tournament at the age of six. Aaron remembers losing all of his games at the first rated tournament he played in, but he continued to improve and soon found himself bringing home the trophies for various K-12 tournaments. As a result, he was entering open tournaments for adults. “Technically, I’m a candidate master. And if I wasn’t cheap, I could be a FIDE master: you have to cross a rating and pay $100,” Aaron said. Aaron has found success just as his grandfather did. Currently, he is ranked as the second-best chess player in Georgia and is in the top 90 nationally. Among under-21 players in the US, he is ranked in the top 10. He now plays about 10 tournaments a year due to the scheduling demands of college. His biggest win came in high school when he won the North American U-16 chess championship. “In the past, Georgia Tech Chess Club hasn’t been an official U.S. affiliate, which would mean that we can run tournaments here. Then people from all over the state or anywhere could come here and play,” Aaron said. He took the first step by signing himself up to be a tournament director. Once the chess club is officially recognized, Aaron can organize tournaments to be played on campus. This would allow Tech to increase its influence nationally and hopefully also attract more Jackets into the game of chess. “Once we get Georgia Tech official, we can start running tournaments here and basically be a catalyst for other people in terms of chess. I want to try doing some help sessions or some training or tutoring so that people can go further in their game instead of being just casual players,” Aaron said. Last year, the club only played in one unrated team tournament for fun. They brought four players from the club and competed against teams from Emory University and University of Georgia. Aaron won all of his matches at the tournament. “This semester, I want to get it more official, more engaged, more competitive, more involved. Nationals too; a lot’s possible,” Aaron said. In a tournament, teams have four players who play one another. Wins and losses affect how many points the team earns. These tournaments would help to increase student involvement and also help players get accustomed to the points system and time control. The next step would be to hold open tournaments to allow players outside of Tech to enter. This year, the national competition takes place in Texas. To participate, Tech would probably take seven students: four board players, two alternates, and a manager. All of this effort will help to grow the game of chess on campus and hopefully get more students to join the chess club. The club has been planning ways to get people interested in chess as well. “We have some ideas. On Skiles Walkway, I might do a blindfold display or a simultaneous display, where I play a bunch of people at the same time or I play people with my eyes closed,” said Aaron. The club is not meant to be limited to players of Aaron’s caliber either. Many players of different skill levels come to play and have fun. Some people stop by to play a game, others to just ask questions about chess, and many to just spectate. Fourth year CS major Tim Chu has been a member of the chess club since his first year at Tech and encourages casual players to drop by. “Chess club is something I do on Friday afternoons to unwind from a long week. Usually, we’ll play chess and eventually move into Bughouse, which is two-on-two chess. We’ll do that until we get bored. We’ve played Bughouse until 11p.m. or midnight. So we have a good time here. Casual players are definitely welcome here. We love that,” Chu said. The chess club meets across from the Student Center Post Office starting around noon every Friday, and anyone is free to drop by and participate and get to try their luck against Aaron.